Udayan Care welcomes Ms. Gita Ranjan - Volunteer Coordinator, Ms. Deepshikha Ghose- Asst. Manager - Volunteer Management, and Mr. Adil Sanwari - Resource Mobiliser. With the fresh flock in, we look forward to some fresh action soon. Not less than a dream! Enter our Children’s Home at Sant Nagar and you enter a world full of fantasies. Ms. Sujata Ranganathan, the Architect and her team labored for days, pro bono, converting our 14 year old Children’s Home (the 1st Udayan Ghar) into a ‘Dream House’. Any guesses on who took care of the soaring bills of the contractor? It was Indian Oil once again! The Corporate has been sponsoring this Home for children since past 5 years and they continued to support us in this endeavor too. The remaining amount was footed by one of the international volunteers at the home, Ms. Mehr Agarwal. This 18 year old, volunteered at the home two years back, when she was merely 16 and now she has returned to us as a donor. Good going kid! The walls and furniture took their colour from the Mentor Mother of the Home, Ms. Isabel Sahni while they were draped by Ms. Kaushalya Madhwan, one of our donors and volunteers at the home. We just cannot thank all of you enough for creating a masterpiece for our children. We hope a similar fortune for our other children’s homes too. Donors/ sponsors/ volunteers/ mentors, hope you are listening! MAX India foundation along with MAX Health Care very kindly agreed to do a general health check up of all our kids every quarter while JK Risk Managers & Insurance Brokers Ltd. provided health insurance to some of our children and are looking for sponsorship for more. Our children will be healthier because of you now! Thank You! The dynamics of professional relationships can only be understood if a person observes the interactions that take place in a strictly professional set up. Thus, we encourage our children to visit various Corporates and experience a life that will soon be their own. Hence, Corporate Mentoring Program with CSC, Steria, Absolutdata, MakeMyTrip.Com and adidas continued at our various homes. Orange, a Corporate at Gurgaon celebrated the completion of 4 years of their ‘Major Service Center’ with our boys from the Gurgaon Home. Children took part in a painting competition there. Children from Greater Noida participated in a Talent Hunt organized by an NGO, Amrit Path and won a cheque of Rs.1100/- for their exemplary Yoga performance. Noida boys’ home hosted Rakhi celebration this year by inviting the entire Udayan family to their premises. Relationships rekindled as children once again pledged their love for each other. Big FM celebrated Satkrishna Janmashthmi Function by inviting our children from Sant Nagar to their corporate office. Children stole hearts by giving a dance performance there. Girls from our Sant Nagar and Mehrauli Homes received an opportunity to think afresh when they were invited to a modern art exhibition that was organized by Mr. Anubhav Nath. His organization, the Ramchandernath Foundation roped in some well known artists who directed the inmates of Tihar jail into making some beautiful paintings which were then placed in an Art Exhibition at ‘Mati Ghar’. ‘Ek Bandar Hotel ke Andar’, this was the tiltle of the movie that was shown to our Sant Nagar children by DHL. The Corporate also donated nightgowns that brought more colour to the dreams of our children at Sant Nagar. The girls simply adored them. 9 girls from our Greater Noida Home, dressed in pink and black costumes sponsored by Mary Kay, presented a beautiful song at the Mary Kay’s Dealer Meet. Touched by our work, the Corporate has decided to donate us a dollar each on every sale of its 2 lipsticks. Two of our girls from Sant Nagar joined vocational courses at South Delhi Polytechnic for Women after completing their schooling and are now staying at the institute hostel. The other two from Greater Noida found employment at a Cosmetic Shop and a Book Store at Greater Noida. Parents, since ages, have been spending sleepless nights over their children’s studies. The same is true for our mentor mothers and fathers. They continue to fret about it while the children spend their days in blissful ignorance. Therefore, this period too saw Dr. Deepak Gupta, our Child and Adolescent Psychiatrist and Ms. Priyanka Goenka, the Psychologist addressing the issue of motivating children towards studies. In the month of July, the Caregivers found solace in Ms. Sadaf Farooq, the Social Worker at Sant Nagar Home who discussed solutions to the mental/ emotional/ physical problems that the caregivers face every day while dealing with the children. While August called for showing more ownership towards the homes and the responsibilities assigned to the caregivers. Thank You Dear Donors for making our cause your own and helping our various projects grow through your donations. We thrive on you! Teach India Campaign once again helped us showcase our work before thousands of people aspiring to volunteer with us. We were overwhelmed to receive almost 500 enrollments for our 9 Children’s Homes. We have already roped in a number of candidates and are still in the process of contacting more. We are extremely grateful to Seamus Jennings and Dee Jethwa, social care experts who specially arrived from London to meet all our stakeholders in order to assess the strengths and gaps in our system and develop a replicable model of the same. We look forward to receiving trainings from them in near future on how to improvise upon our systems. Joining Hands, Via and Volunteering Solutions continued to help us receive foreign volunteers for our children’s homes. Volunteers from Germany, Denmark, USA, Canada, Hungary, France and Ireland came to us during this period and continue to provide their services to our children with great commitment. For two months, Ms. Nasreen Singh volunteered to work for our cause and helped us in our endeavor with the Times of India group, the Home of Joy initiative as well as our upcoming Marathon. She made presentations for us on Teach India Volunteer induction as well as helped us in our database. SOIL sent us a few of their students from SIP (Social Initiative Program) to work as interns with us. We received another set of interns from Delhi University, Kamla Nehru College and Indraprastha University, New Delhi and one from University of Petroleum and Energy Studies, Dehradun. CWC Member, Mayur Vihar, Dr. R. Narayan paid a visit to our Pratap Nagar Home for boys and certified it as a ‘fit’ organization for children. Impressed by a presentation made on Life Skills by Dr. Kiran Modi at NCERT, the NEUPA teachers visited our Sant Nagar Home and interacted with our children. The famous Anthropologist and Psychologist, Mr. Sudhir Kakar and his wife Ms. Katharina Poggendorf Kakar, Mr. Vikram Lal from Vikram Sarabhai Trust honored us by paying a visit to our Sant Nagar Home. Our Greater Noida Home received Fellows from the Prime Minister’s Global Fellowship Program, England. One of our resource persons, Mr. Sameer Pathak, who also volunteers at our Udayan Ghar, Noida made possible an extremely interactive and informative workshop for our USF Fellows in Delhi, on the choice of career. 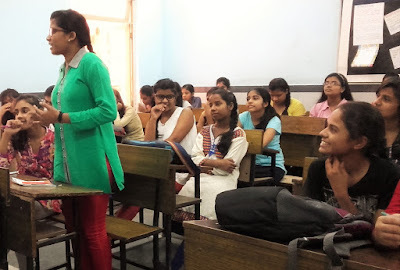 The zeal to secure an empowered future was evident in the Fellows as they attended the workshop that was organized at Mahavir Senior Model School. Mr. Pathak invited 7 professionals from different walks of life who inspired our girls to transform themselves into eternal winners. Successful people from Media, Marketing, Information Technology, Fashion and Apparel, Mass Communication, Retail and Pharmaceuticals shared pros and cons of their profession with the group. It was a great exposure for our Fellows as they received first hand information on the various options available. This workshop enabled them to choose a path that would turn their dreams into reality. Children of class X and above, who are living at Udayan Ghars too gained from this workshop.This was at Delhi while at Aurangabad, 16 Fellows attended a discussion held by Ms. Aparna Mathur, Ms. Dimpi Machhhar and Ms. Anuradha Dhoot on current issues. They also received inputs on the Computer course that they are pursuing in Post Grdauation. In search of Need, Ambition and Talent ! Selection process for the 8th batch at Delhi saw 316 aspiring candidates appear for a NAT exam. This exam is meant to hunt the degree of need, ambition and talent in a candidate. A similar process was held for the 2nd batch of induction at Dehradun. 280 candidates appeared for the exam. We thank Kusuma Foundation for sponsoring yet another 100 Fellows at our Dehradun Chapter. Mohd. Faheem Khan, the Sr. Program Coordinator has been assigned the task of steadying our chapter at Dehradun. Under his skilled guidance, fresh inductions will be held and our new appointees shall be fully trained so that they can take on the responsibility of the entire Chapter. With the Sr. Coordinator of the Program shifting his base to Dehradun for managing the USF Chapter there, Mr. Sajan Mathew, Sr. Program Coordinator, USF Delhi was handed the responsibilities of managing the Outreach Program. Therefore, he was introduced to the beneficiaries as well as their HIV infected parents. Mr. Mathew conducted his first workshop with the beneficiaries in the month of August on the importance of studies in life. An increased interest was seen in the children as the facilitator broke the monotony of the session through lighthearted jokes. Yet another Community Mobilization Program was carried out in Badarpur and Pehladpur with an aim to sensitize masses on the importance of technical education as it would help them acquire latest skills and expertise. This would create a positive impact on their living standards and make them more self-reliant as well as increase job opportunities for them. Independence Day was celebrated with great enthusiasm at our Badarpur Computer Center. Students and the faculty arranged competitions in Drawing and Mehandi and a Lemon and Spoon race. They entertained the audience through poems, songs, jokes and Gazals. Later, prizes were given out by our Centre Manager, Mr. Bipin Bhatnagar and refreshment served. 37 new enrollments took place at our Vinod Nagar center while 24 students were presented certificates for passing out. At Badarpur, 22 joined in as 25 received certificates while at Gurgaon 23 new candidates were enrolled and 14 were certified. Dharuhera saw 21 joinings and 24 passed outs while at Greater Noida 7 new candidates joined our course and 3 were handed certificates. On the whole, 110 new candidates joined our various centers with a total of 90 candidates were certified during this period. Rakhi stalls put up at Mary Kay, Tatvakala, Ankur and HP brought in huge profits as the employees chose to aid our organization by purchasing Rakhis and other decorative pieces from our stalls. Our children plan to give a beautiful performance, directed by Stephen Marazzi, the famous Theatre and Music Director, during the Joy of Giving Week (September 27- October 3, 2009) that has been conceptualized and organised by Giveindia. Under our ‘Employee Corporate Partnership-in-Giving’ Initiative, we hope to get volunteers to engage in acts of giving- money, time, skills or simple acts of kindness. With this aid we dream of building two separate homes for boys and girls at Dehradun and bring in more needy children under our sheltered care. 14 Corporates already registered. Join us quick! Airtel Delhi Half Marathon (1st November):- Come, participate in the Corporate Challenge (2.9lac) or become, our Dream Teamer. Raise Rs.1 Lac for our children by 28th October, 2009. Call us fast! Your support will help to transform the lives of many, many more innocent lives.